Joseph Walter "Joe" Jackson (July 26, 1928 – June 27, 2018) was an American talent manager. He was the father of the Jackson family of musicians. His most famous son was Michael Jackson. His most famous daughter was Janet Jackson. Joseph Walter Jackson was born in Fountain Hill, Arkansas. He was the eldest son and child of Samuel Jackson (1893-1993), a schoolteacher, and Crystal Lee King (1907-1999). Samuel was the son of Israel Nero Jackson (1838-1934), a slave. Isreal was the son of Jack July Jackson (1803-1908), an indigenous choctaw of the Plantation of Gale. He was raised in East Chicago, Indiana and in Gary, Indiana. Jackson married Katherine Jackson in 1949. In 1963, Jackie, Tito and Jermaine started a band called The Jackson Brothers. Joe was their manager. The band changed their name to The Jackson 5 and they became su Michael fired Jackson as his manager in 1979. The rest of the brothers did the same in 1983. In 2002, Jackson was given a place in the Rock and Roll Hall of Fame for being the Best Entertainment Manager of All Time. In 2003, Joe told Louis Theroux that he whipped Michael when he was a child. Michael Jackson died in 2009. He did not put Joe in his will. In November 2012, he had a stroke. Jackson told Piers Morgan in 2013 that "There's no such thing as beating a kid". Jackson also has a daughter with Cheryl Terrell. Terrell is a woman that Jackson had an affair with for 25 years. The daughter, Johvonnie, was born 1974. In July 2015, Jackson was rushed into hospital after suffering a stroke and heart arrhythmia while celebrating his birthday in Brazil. The stroke reportedly left him temporarily blind. On June 23, 2018, it was reported that Jackson was hospitalized in Las Vegas in the final stages of terminal pancreatic cancer. He died of the disease on June 27 at the age of 89. ↑ "Singer Jackson whipped by father". 13 November 2003 – via news.bbc.co.uk. ↑ "Jackson 'took revenge on abusive father' by cutting him out of his will". Mail Online. ↑ McKay, Hollie (26 March 2015). "Joe Jackson in 'serious' condition after stroke". Fox News. ↑ "MJ's dad: No such thing as beating a kid". 31 January 2013. ↑ Khan, Urmee (14 September 2009). "Michael Jackson's secret sister JohVonnie Jackson says she was 'rejected'" – via www.telegraph.co.uk. ↑ "Joe Jackson admitted to hospital after stroke". USA TODAY. ↑ "Michael Jackson's father Joe 'left blind after suffering stroke'". Mail Online. 27 July 2015. 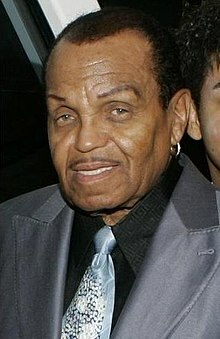 ↑ "Michael Jackson's dad Joe Jackson reportedly hospitalized with terminal cancer as Jermaine reveals he's on deathbed". www.msn.com. ↑ "Joe Jackson, father of Michael and Janet Jackson, dead at 89". Retrieved 2018-06-27.